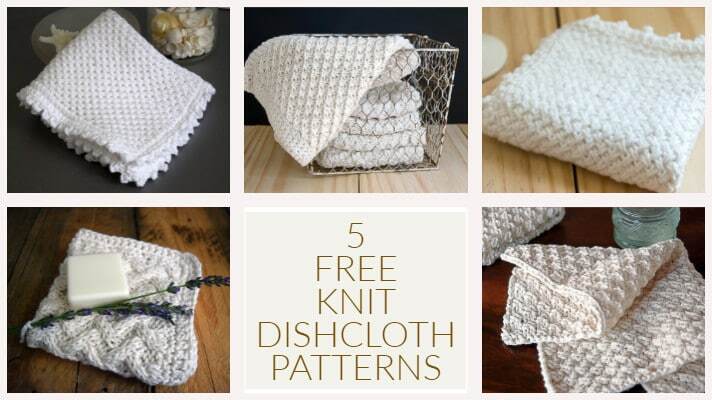 These 5 free knitted dishcloth patterns are always some of my most popular patterns. Knitted dishcloths and knitted washcloths are quick and easy projects; you could quickly knit up a dishcloth stash for gifting or for keeping for yourself. And speaking of ‘stashes', an easy knit dishcloth pattern is also a great yarn stash busting project! And while you have access to all the patterns, subscribers to Nourish and Nestle also have access to the free, downloadable PDFs of all patterns. If you are interested, you can subscribe here. What kind of yarn is best for dishcloths? Stick to cotton or cotton blends for your dishcloths. If you go the blend route, make sure it is primarily cotton (70/30 or 80/20) as the cotton is what makes the yarn absorbent. Our friends at Michaels have an extensive inventory of yarn for any pattern. For the most absorbent dishcloth, you want an unmercerized cotton as the mercerization process reduces the absorbency of the fibers. Unmercerized cotton is nubbier and has a more ‘natural' look to it. However, mercerized cotton dishcloths will have a nicer sheen, come in a wider range of rich colors, will most likely last longer and won't get as ‘soaking wet' as a result of the mercerization process. So, it's a ‘personal choice'…not sure that there is a right or wrong. How Big Should a Dishcloth Be? It seems the standard dishcloth, washcloth or facecloth size is about 10 inches by 10 inches (25 cm by 25 cm). That being said, make the size you want! 5 free knitted dishcloth patterns that can also be used for washcloths or facecloths. The Printable PDF of these patterns are available for free to all Nourish and Nestle subscribers. Quickly knit up several washcloths with this Daisy Stitch Knit Washcloth Pattern. They make the perfect for gifts or for your own use. Written and video instruction make this a very doable project. The washcloth that started it all! The basic moss stitch results in a perfectly nubby and functional washcloth that knits up quickly. I love the woven pattern that results from the Diagonal Basketweave stitch. Finished with a picot edging, this washcloth is perfectly giftable in a lovely 'spa' package. Video instruction helps for those who prefer to see the process. I have always been a sucker for cables...so it's fitting that they found a way into some washcloths! Or, pop over here for all my knit & crochet patterns in one place. Thanks again for spending a few minutes of your busy day with me today. Please know that I welcome each and every comment that comes my way. If you want to make sure you don’t miss future content, pop your email in the beige box up on the right or click here. I usually send out 1 email a week, so I won’t inundate your inbox…believe me, I’m sensitive to an overflowing email inbox! That’s a brilliant use of your swatches! Thanks for sharing it and I will be passing it on. Do you only use cotton or cotton blends for your dishcloths? To date, that’s the only fiber I have used. Just curious what your experience has been. Hi there, I’m Lynn. I’m in my happy place when I’m cooking, baking, creating, crafting, diy-ing and gardening. You too? Hey, we should be friends! You can reach me at [email protected] and read more about me and what you can expect here.